This episode of The Engineering Commons finds Adam, Brian, Carmen and Jeff predicting how virtual and augmented realities might soon be incorporated into daily engineering activities. Adam’s not so sure he’s ready to plug into the Matrix. Brian suggests that understanding differential calculus is much less practical than knowing Kung Fu. Bullet time is a visual effect that transforms a viewer’s perception of space and time. Brian is not impressed by the argument claiming we live inside a computer simulation, as it seems to violate Occam’s razor. The story of “turtles all the way down” may be reviewed on Wikipedia, as Brian gets interrupted before finishing his explanation. Virtual reality (VR) simulates a user’s presence in a computer-generated environment. Augmented reality (AR) seeks to enhance (or modify) a user’s perception of their physical environment. A well-known device that made use of augmented reality was Google Glass. Two VR headsets currently available to consumers are the Oculus Rift and HTC Vive. Two AR headsets that show promise, but are not yet available to consumers, are the Microsoft HoloLens and a yet-to-be-named product from Magic Leap. Videos touting Magic Leap’s technology popped up on the internet about six months ago. Some users experience a form of motion sickness when exposed to a virtual environment. Foo is an interesting attempt to create a shared virtual environment. Ubiquitous computing refers to the notion that computing will soon happen anywhere and everywhere, with every device providing a computing interface. One possibility for creating an augmented reality, without wearing a headset, is the use of smart contact lenses. 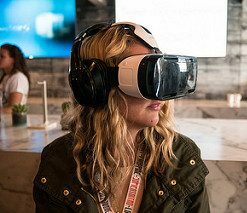 Thanks to Nan Palmero for use of the photograph titled “Woman Using a Samsung VR Headset at SXSW.” Opening music by John Trimble, and concluding theme by Paul Stevenson.